Unfortunately just because the specification is well established and Android has supported it for years doesn’t mean that your device automatically supports it. In addition to the required Android kernel component and/or drivers, there needs to be actual support by the physical hardware in your phone. No physical support for host mode via OTG, no OTG goodness. In fact the only real decisions to be made when it comes to OTG cable shopping are: whether you want to wait a month on shipping from Hong Kong to get the cheapest one possible and whether or not you want an OTG with charging capabilities. 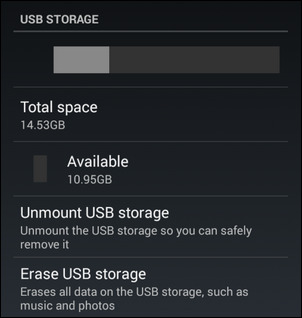 When you’re done with the flash storage, this is the menu you want to visit in order to use the ‘Unmount USB storage” option to properly unmount and remove your media. 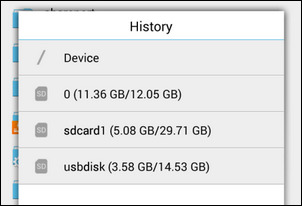 Here is our flash drive as seen in the drive-selection menu in ES File Explorer, listed as “usbdisk”.